Beautiful ORANGE & BLACK 'Halloween-Theme' jumper dress set features WHITE KNIT TOP with EMBROIDERED CAT & PUMPKIN plus PICOT TRIM at the mock turtleneck and long sleeves. 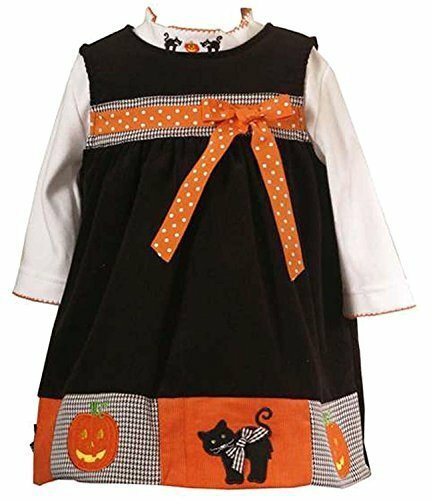 BLACK corduroy jumper dress features round neckline with DOTTED GROSGRAIN RIBBON & BOW TRIM at the EMPIRE WAIST and COLOR-BLOCK BORDER HEM featuring ORANGE PUMPKIN and BLACK CAT APPLIQUES with 3-D BOW and GREEN SPARKLING BEADED EYES. Hand wash, line dry. Imported. Matching/Coordinating SISTER SIZES available in sizes 12M-4T, search for style(s): RRE-30797 More 'Halloween-Theme' dresses/outfits available, search for: " baby-halloween-theme-clothes "
ORANGE & BLACK 'Halloween-Theme' jumper dress set features WHITE KNIT TOP with EMBROIDERED CAT & PUMPKIN plus PICOT TRIM at the mock turtleneck and long sleeves. 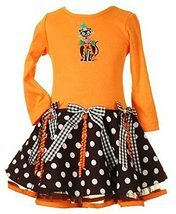 BLACK corduroy jumper dress features round neckline with DOTTED GROSGRAIN RIBBON & BOW TRIM at the EMPIRE WAIST and COLOR-BLOCK BORDER HEM featuring ORANGE PUMPKIN and BLACK CAT APPLIQUES with 3-D BOW and GREEN SPARKLING BEADED EYES. Hand wash, line dry. Imported. More 'Halloween-Theme' dresses/outfits available, search for: " baby-halloween-theme-clothes "